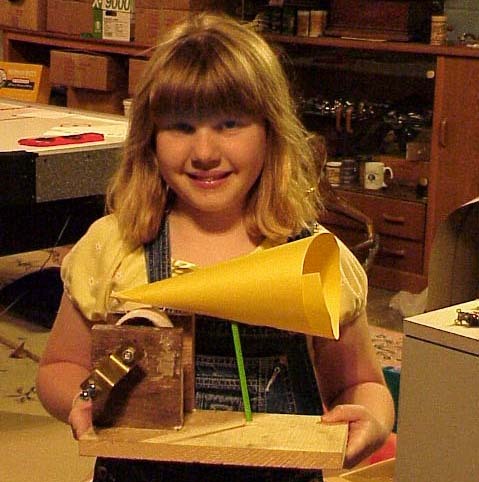 The object is a working phonograph - something of a cross between a tinfoil machine and a wax record. We wanted to make a tinfoil machine, but lacking a lathe (and I think the kids are supposed to do most of the work anyway) to make a perfect mandrel with grooves, we made the best mandrel we could using common parts from the plumbing department at the hardware store. We locked the mandrel in drill press to true it up somewhat. When we were done it was slightly off by maybe 1 mm. The shaft was a long bolt. We covered the mandrel with candle wax (paraffin), spent over one hour shaving the mandrel down to be true and smooth by holding a piece of brass strip against it while we cranked the cylinder back and forth. We inserted a steel phonograph needle backwards (so the blunt end faced out) into an old disc phonograph reproducer and mounted a small 6" horn to it. I held it in place and turned the crank while my daughter made a 15 second recording. You will not believe me but it really worked! Having run out of time for the project I simply played it back electrically to verify that we actually made a recording, which made my daughter very happy that it really worked. We then fashioned a horn from colored paper and inserted a wood toothpick for appearance. Just to play around we cranked the handle and the sounds (although now very poor and not understandable) came out of this improvised reproducer! Unfortunately the paraffin cylinder proved to only be good for three plays so I cannot share the audio with you....it was admittedly very crude but enough to excite an 11 year old. If I had more time I would try to coat the cylinder with the remains of old brown wax records. Also the little machine needs something for a flywheel. If I were to redo it, I would fill the mandrel with plaster or cement to make it heavier. 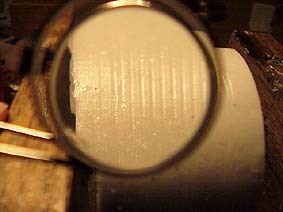 The paraffin cylinder as seen though a magnifying glass. 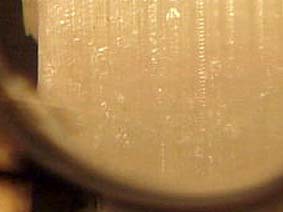 Detail of the image at left, with the sound waves in the paraffin clearly visible.